Parrot Disco Pro AG is the all-in-one multi-purpose drone solution for farmers that fits in their everyday tool box to help them improve the ROI of their crops. This end to end solution allows farmers and small agriculture cooperative to have easily and quickly insights on the health of their crops thanks to visual crop scouting and NDVI maps. Parrot Disco-Pro AG is the easy to use and reliable solution that allows you to quickly identify crop health and problem areas. Analyse and decide. Flight planning software. NVDI maps via cloud service. The powerful and easy to use agricultural cloud mapping platform that processes the captured crop data into actionable insights. In 3 simple steps: create your account, upload your photos to the cloud and generate your actionable AIRINOV report. 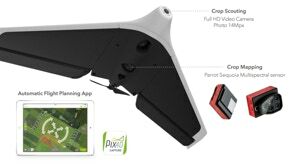 Pix4Dcapture becomes the first flight planning app in the market to support a fixed wing drone. • Optimised for Parrot Disco-Pro AG, easily define flight missions on mobile devices to map crop fields. • Customise mapping parameters like flight altitude and overlap according to your needs. • Control the whole flight from the frontal camera of the Parrot Disco-Pro directly in Pix4Dcapture.